Albrecht Dürer was born in 1471. I was born in 1971. 500 years ago in 1514, he made what I consider to be the greatest engraving of all time – Melencholia I. He was 42 and turned 43 in May, very close to the age I am now (I turn 43 in December). In recognition of the 500th anniversary, here are some thoughts in response to Melencholia I. During my first year as a grad student at Yale University, I had a student job in book conservation in the basement of Sterling Memorial Library. 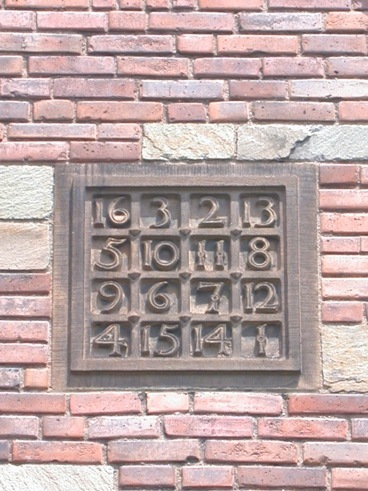 Occasionally, I would eat my brown bag lunch in the enclosed Sterling Memorial Library courtyard and one day, noticed a square of numbers up high over a dormer window. I’d seen something like it before, but couldn’t remember where. It’s a square of the numbers one through sixteen and they’re arranged so that any way you add a row, the sum is thirty-four. The sum of the four center squares, the four middle outer squares either horizontally or vertically across, and the sum of the corner squares is also thirty-four. Later that week, I was looking at the Alberto Giacometti monograph by Yves Bonnefoy and there on page 214 is a reproduction of the engraving titled Melencholia I by Albrecht Dürer. That was when I consciously noticed that in the engraving on the wall over the adult sized angel and under the bell, is the same square of numbers one through sixteen. In Bonnefoy’s Alberto Giacometti book, Melencholia I is incorrectly dated as being from 1513. There are three important reasons why it’s good to know that it was actually made in 1514 and not 1513. 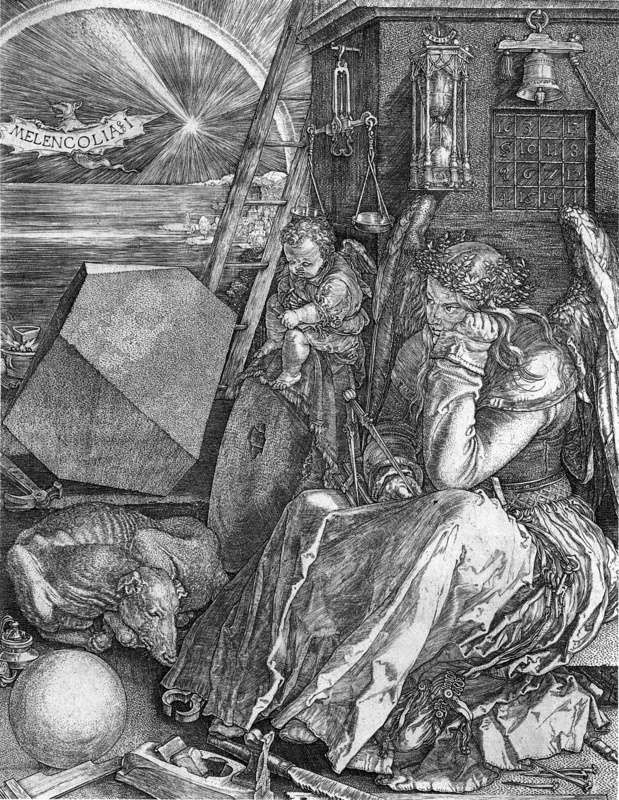 First, Dürer dated the engraving in the image (right under the adult sized angel’s seat) to the year 1514. Second, the adult sized angel’s wing is touching the 14, which comes right after the 15 in the lower row. Many scholars have suggested that this was in reference to the year Melencholia I was made. And third, Albrecht’s mother Barbara Holper Dürer who was born in 1451 died in 1514, which probably contributes to the emotional tone of this heavy image. In March 1514, two months before she died, Albrecht made a drawing of his terminally ill mother. 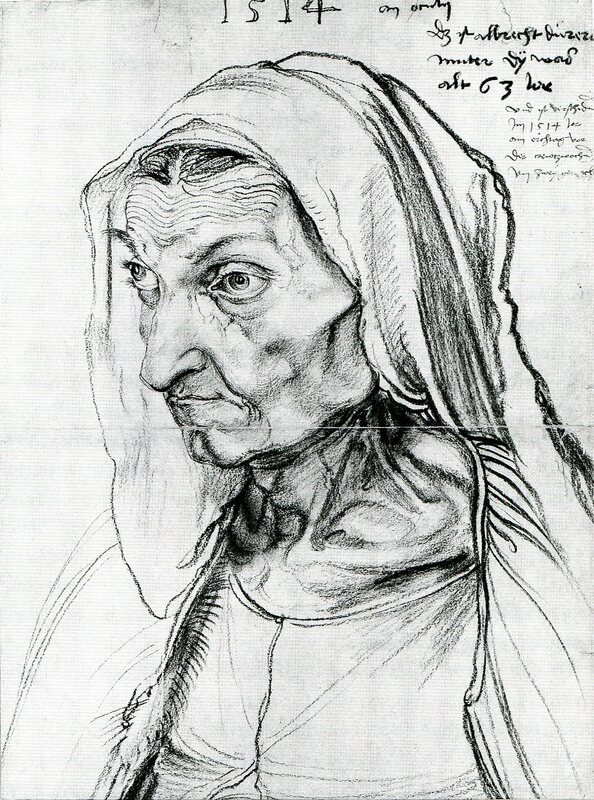 He later wrote on the drawing, “This is Albrecht Dürer’s mother when she was 63 and she passed away in the year 1514, on Tuesday before Rogation Week (May 17, four days before Albrecht’s 43rd birthday), about two hours before nightfall.” After she died Albrecht wrote “she died hard” and “I felt so grieved for her that I cannot express it.”2 At first glance, this may look like a drawing of a sinister old crone. Actually, this is an empathetic and loving son who wants to help his mom in any way he can and the best he can do is to try and set her image in charcoal to preserve what little life she has left. This is Albrecht doing his best in the face of one of the absolute worst events that any of us will ever go through – seeing your mom suffer without being able to help and ultimately losing her. The magic square connection between the one in the library at Yale and the one in Dürer’s engraving led to a long meditation on other aspects of Dürer’s Melancholia I. I began scheduling appointments with the Metropolitan Museum of Art’s Prints Study Room and I’ve since been back many times to study the six impressions of Melencholia I in the Met’s collection. I’ve gleaned a rich vocabulary of graphic marks for my own use from an extensive close study of Dürer’s engraving. Each area in Melencholia I has it’s own graphic texture. Seeing how many layers of line overlap in given areas, where he used broken lines, dotted lines, how he used directional forces, or the many varied combinations of line shapes has been a great lesson in the potential of black line-work on a white ground. Particularly in our time on the timeline of the history of art, I believe it’s more important than ever to recognize and acknowledge the tremendous potential of simple means on a small scale made by one person in the privacy of his or her intimate space. Materially speaking, all you really need to make something equivalent is a pencil or pen and a 10 x 8” sheet of paper. Or if you’re more ambitious, an engraving tool and a 10 x 8” copper plate and access to a print shop. There are two angels, a bat, and a dog in Melencholia I. The baby angel sits on a grindstone and is writing or drawing on a small lap tablet. Something that I discovered by studying the engraving under a magnifying glass over the course of many hours is that the baby angel’s back wing goes behind the ladder (Jacob’s ladder?) in the background. The top and longest feather of his right wing appears over the rung of the ladder. This breaks the pictorial logic of the image. In my opinion, this subtle detail signifies that unlike the earth bound saturnine angel, the baby angel, (also called a putto) is not bound to the physical laws of our world and that he’s free to move between heaven and earth. If the earth bound melancholy angel is a spiritual self portrait, as Panofsky thought and I think too – then this little guy might be Albrecht’s way of sending a message directly to his mother in heaven. Maybe what he’s writing on his slate is a message to Albrecht’s beloved mother, spoken by the depressed earth bound angel. Maybe he’s just about to fly up that ladder and deliver the message to Albrecht’s mom. And maybe the powerless artist angel is realizing that no matter how hard she tries, she will never be able to save her mother or anyone else with charcoal or any other tool available on earth. Behind the cube with the corners knocked off, there is a pot of something in the shape of a triangle in a fire. Erwin Panofsky suggested that it’s boiling lead and that this boiling lead is related to the comet from Saturn that is causing a nighttime rainbow and the water level to rise. 16th Century alchemists believed that there was a metal associated with each of the seven planets. The metal of the Sun being gold and the metal of Saturn being lead.3 (Good thing they didn’t have the task of assigning metals to all of the planets we know of throughout the visible universe in 2014!) At some point after many years of thinking about the burning pot of lead in Melencholia I the following line of thought came to mind; four of the days of the week – Tuesday, Wednesday, Thursday, and Friday are all named after Nordic gods. Tuesday being named after Tyr, the Nordic god of war, Wednesday after Wodan or Odin the father of Thor and the husband of Freyja, Thursday after Thor, and Friday after Freyja who was also Thor’s mother. Saturday (Samstag) is Saturn’s day, Sunday (Sonntag) is the Sun’s day, and Monday is the moon’s day. When I started thinking about the days of the week in this way, I began to wonder if symbolically for the alchemists, Saturday becoming Sunday must represent the weekly achievement of their ultimate goal of transforming lead into gold? Notice that the two tools sticking out from under the angel’s skirt are standard tongs for picking up coals or hot metal and a bellows for delivering additional air to the fuel and increasing the rate of combustion and therefore heat output. It looks to me like she really wants that lead to turn into gold! Which leads to the question of whether Dürer would have thought of this scene as taking place on Saturday May 21, 1514? That would have been the first Saturday after the death of his mother and his own 43rd birthday. 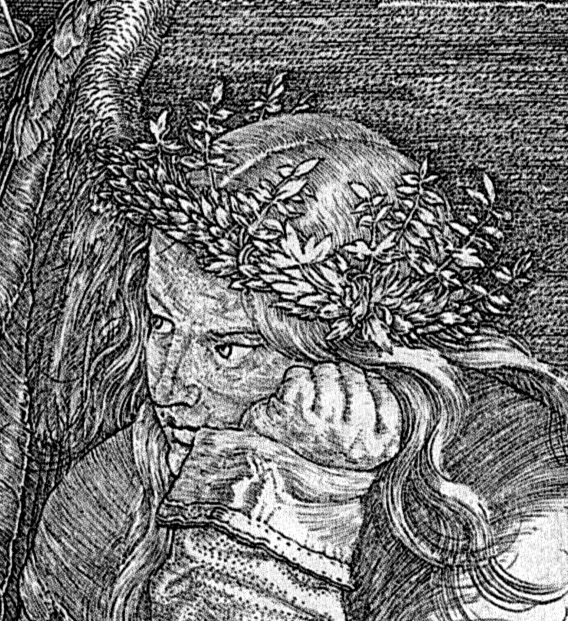 The melancholy angel is wearing a wreath of watercress. In Dürer’s time, common knowledge was that each person was dominated by four humors – yellow gall, black gall, phlegm, and blood. Melancholics were thought to suffer from excessive black gall, dryness of the body, and they were considered most susceptible to insanity, however, melancholy was also considered a side effect of creative genius. Now in 2014, the clinical consensus is that depression and irritable bowel syndrome are intertwined. IBS can come in the form of diarrhea or the opposite problem of excessive constipation. A treatment for melancholia in 1514 was to wear a “wreath of the leaves of plants having a watery nature” to help moisturize the head and balance the four humors.4 The remarkable thing is that current clinical studies suggest that the placebo effect for depression and for IBS is consistently high.5 Which leads one to believe that wearing a wreath of watercress and water-ranunculus as the dejected melancholy angel is, probably was an effective palliative for melancholy in 1514. Considering Albrecht’s mother died in 1514, I wonder – did he try the wreath of watercress treatment himself? Could he have been wearing a wreath of watercress and water ranunculus while he was working on this engraving? Dürer also wrote that a cure for the blues was music – particularly music played on string instruments. Which brings another question to mind – would Albrecht Dürer have been a Led Zeppelin fan? I wonder if he would have liked No Quarter? In 1513, Dürer made the engraving titled Knight, Death, and the Devil or Reuter (Rider) as he called it. My first exposure to the work of Albrecht Dürer came at 17 when I saw the Rider in a book in my high school library. I immediately recognized it as being the image that must have inspired the Led Zeppelin song No Quarter. It was the first time that I discovered a connecting link between two works of art that I was particularly excited about and the discovery heightened the greatness of No Quarter and of the Rider in my mind. Discovering this connection gave me the feeling of knowing a secret and that connection felt like my own thing. I had earned it by finding it. It was mine. Now, over 20 years later – that first thrill of discovery remains fresh in my mind and both the Rider and No Quarter are still two of my favorite works of art. When I was nine, my father left the Air Force and my parents agreed to help one of his military buddies by relocating from the Air Force base where we lived in Illinois to a small town in Southeast Missouri to help his friend’s aging mother who owned and operated a gigantic campground all by herself. This place in the heart of America was a vortex of travelers from all over who would pay to park their campers or pitch tents ranging in time from a couple of days to a couple of months and sometimes more. Next door to where we lived on the edge of this giant campground was Underhill’s Meat Market where my brother and I spent many sweltering summer days chilling in Floyd Underhill’s butcher shop drinking Orange Crush and watching him turn cow carcasses into packages of wrapped meat in the front display freezer of the market. We always knew exactly where our burgers were coming from. For the three fall seasons we were there, a circus troupe came and stayed at our campground each year. My younger brother and I loved the circus people, the animals, and I especially loved the painted trailers with magnificent circus scenes. My brother Jason and I got to follow along with the roller skating elephant for walks around the campground. And then there was the huge caravan of traveling gypsies who came in late summer all three years we lived there. I never saw my bike again but the story was worth the trade. Which brings me back to Dürer’s Melencholia I and the four nails on the ground in the image. In 17th Century Spain, Diego Velázquez followed his teacher, Francisco Pacheco’s advice to always show Christ crucified with four nails.6 Zurbarán’s great crucifixions also always show one nail through each of Christ’s feet. But the convention in 1514 in Nuremburg was to depict Christ crucified with three nails, not four – as seen in The Crucifixion of Christ by Lucas Cranach dated c. 1510-15 at the Städel Museum in Frankfurt or in Dürer’s own engraved Crucifixion of 1508. Why three nails? I believe that there are both visual and metaphoric reasons for this. 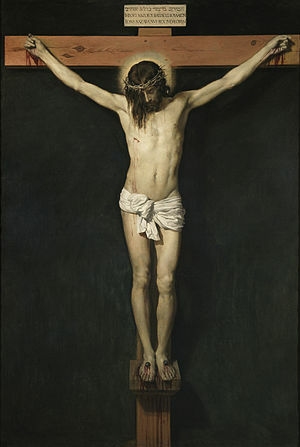 Visually, a three-nail crucifixion requires one leg to overlap the other. This twist of the body rhymes with the gothic spiraling aesthetic of the time. The visual force of this gothic spiral sends the view upward. Three is linked to the holy trinity and the triangle that points up. Three is symbolic of the heavenly reward of Christ’s sacrifice. 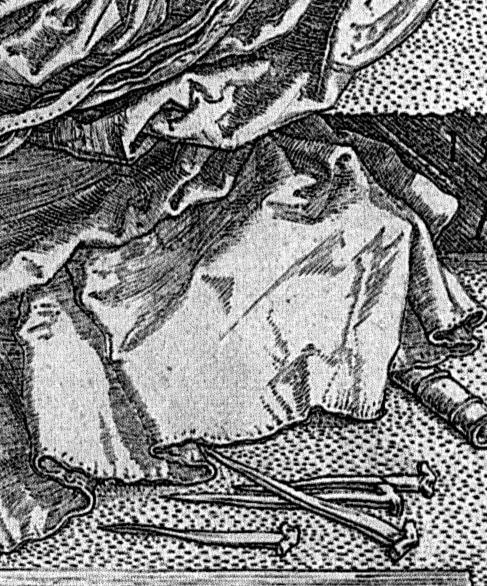 So why would Dürer show four nails instead of three on the ground in Melencholia I? 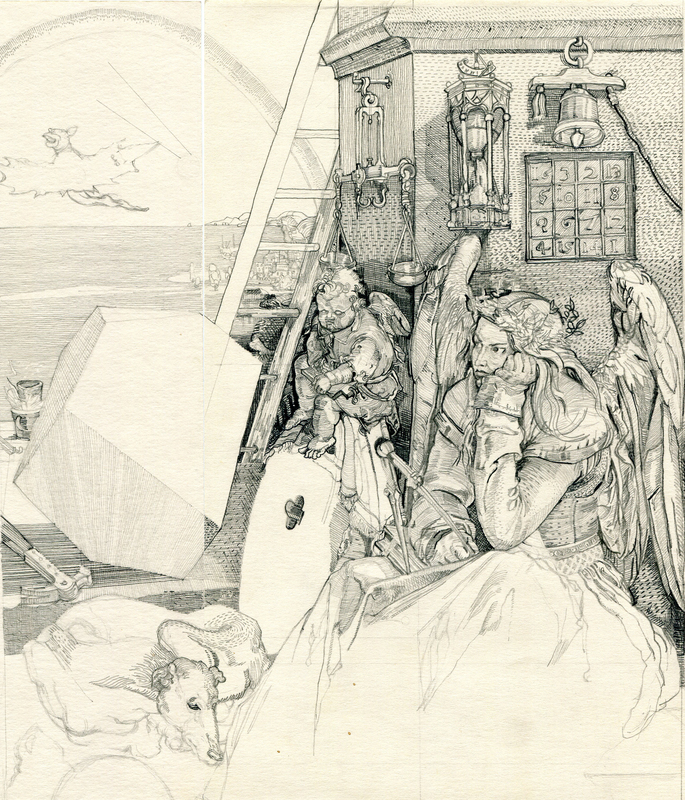 Dürer wrote on a drawing that “keys mean power, purse means wealth”. And in keeping with this idea of symbolic representation, I think it’s safe to assume that those four nails are a reference to the crucifixion and I believe the reason for four is symbolic. Four is an earthly number referencing the four humors, the four directions, the four stages of life, and the four seasons. By using four nails, the emphasis is on the earth bound suffering of Christ, which amplifies the earth bound suffering of the melancholy angel. 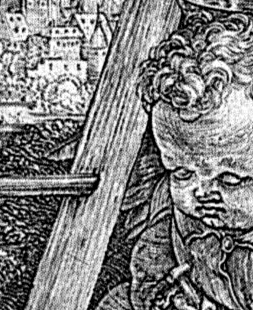 Dürer’s mother may have gone to heaven after she died, but in her last months, weeks, and days – he only saw suffering. I think that’s what those four nails are about. There’s a line in a Jack Kerouac poem that goes, “We own the world, because we’re poor.” Like the melancholy angel whose full purse is the least of her concerns, I’ve never had much care for material things. Ideas have always been more important. Like Evmenis and Theocritus in Constantine Cavafy’s poem, The First Step, I am a proud member of the City of Ideas. And as Cavafy says, “Its councils are full of Legislators no charlatan can fool.” I think it’s probably true that artists as a subset of the world population are more susceptible to melancholy than non-artists, but being able to draw gives one the ability to own everything one sees, conjure new scenes in a way that no amount of money can buy, and preserve the lives of those we love by capturing their likeness for people to see 500 years hence. Unlike a purse of gold, a nail, or a bicycle – no gypsy can steal that. 1. Erwin Panofsky, The Life and Art of Albrecht Dürer, Princeton University Press, 1943. Pg. 170. 2. Grössinger, Christa. Picturing women in late Medieval and Renaissance art. Manchester University Press, 2007. 64. 3. Stanislas Klossowski De Rola, The Golden Game, Thames and Hudson, 1988. Pg. 19.